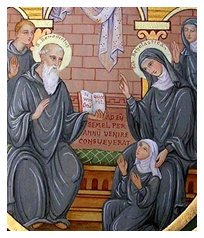 Saint Benedict, the father of Western monasticism, was born into a noble family in Norcia, Italy, around the year 480. As a young man engaged in liberal studies at Rome, he recognized the emptiness and vanity of worldly pursuits and resolved to live in humility and solitude, seeking to please God alone. He retreated to a cave near Subiaco, Italy, where, through the guidance of the Holy Spirit, he learned to master his passions and advance in the ways of God. His holiness and miracles soon became known and others placed themselves under his direction. Eventually, he established monasteries, each with an abbot and united under a common rule. Benedictine monasteries would later play an essential role in the spread of Christianity and culture throughout Europe and beyond. By means of his Rule, Saint Benedict continues to instruct his heirs in the way of holiness. Monastic life, after having been almost entirely eliminated in France during the French Revolution, experienced a reawakening in the heart and mind of a young parish priest in 1833. 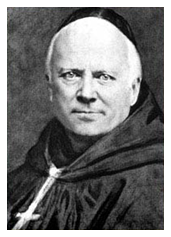 A native of Sablé, France, Dom Prosper Guéranger was inspired to renew Benedictine life, with its focus on obedience, simplicity and community, in the ancient priory of Solesmes. Dom Guéranger’s teaching and writings reflect his deep faith and love for the Church, as well as his ability to extract from her history what is essential and timeless. The Divine Office, the traditional prayer of the Church, was to be the center of daily life in the new community. His monks would take a leading role in the restoration of Gregorian chant, a project Dom Guéranger considered essential to the beauty and fullness of the liturgy. Dom Guéranger had no intention of founding a monastery of nuns until, in his later years, he came into contact with Jenny Bruyère, the future Mother Cécile. She would be the one to most fully assimilate his spirit and teaching and pass it on to the monks and nuns of later generations. Jenny Bruyère was eleven years old when Dom Guéranger agreed to prepare her for her First Communion. There was immediately a deep harmony between the two and the abbot recognized the young girl’s instinct for the things of God and her desire to consecrate herself to His service. 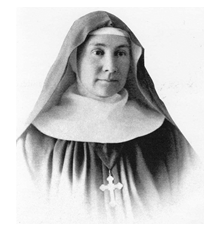 Over time, other women with similar desires presented themselves, prompting Dom Guéranger to recognize God’s will for the establishment of a community of nuns. He watched over the development of the monastery, Saint Cécile of Solesmes, and its abbess, Mother Cécile Bruyère, with paternal solicitude. In 1888, a foundation was made at Wisques, France, which in turn founded the Abbaye Sainte-Marie de Deux-Montagnes, near Montreal, Canada, in 1936. The latter founded the Monastery of the Immaculate Heart of Mary in Westfield, Vermont, in 1981.